Protesters take over Oxford Circus, including installing a boat. The skate ramp covered in Extinction Rebellion logos on Waterloo Bridge. Extinction Rebellion activists have been staging increasingly visible protests, including recently getting naked in the gallery during a session of the UK’s House of Commons. And they’re hardly alone as a growing segment of civil society is agitating for climate action all around the world. The youth school strike movement sparked by Greta Thunberg, a Swedish teenager, turned out 1.5 million students last month. And groups like the youth-led Sunrise Movement have pushed for change well by backing the Green New Deal, staging protests in Congressional offices, and setting up town halls to discuss climate policies. Some politicians from the UK Labour Party to U.S. Representative Alexandria Ocasio-Cortez are also approaching climate change with an urgency in line with what these groups are demanding. And those demands are well-grounded in science. In fact, a major science report put out last year showing what the world needs to do to limit warming to 1.5 degrees Celsius (2.7 degrees Fahrenheit) has in many ways been a catalyst, providing a clarion call for what’s at stake if we don’t act swiftly. 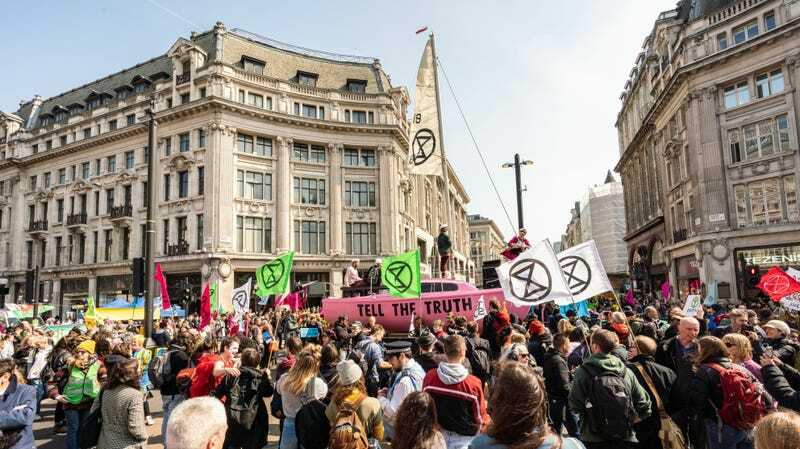 As a reminder that time is of the essence, Extinction Rebellion’s symbol is an hourglass. Each puff of carbon dioxide into the atmosphere sends the sands spilling into the bottom ever faster.